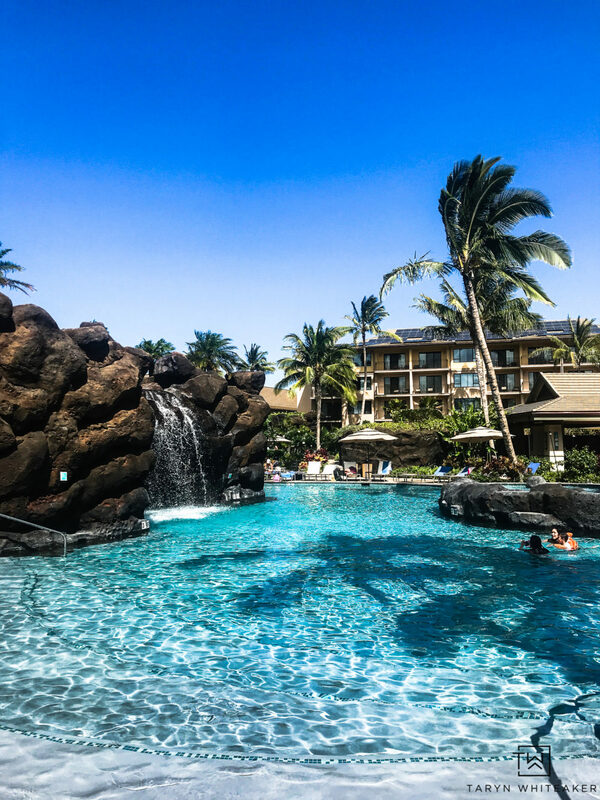 If you follow along on Instagram, you may have seen a few pics from our recent trip to Kauai! My husband and I headed there on a special trip with some friends to celebrate our 10th wedding anniversary. 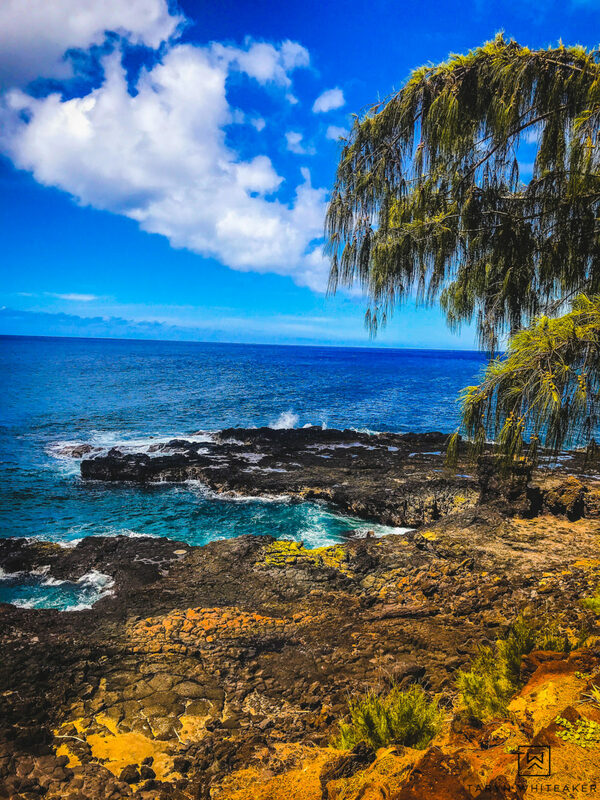 This was our first time on the island (we’ve been to Maui a few times but never to Kauai), and it was absolutely amazing. It was so much fun to explore a new place, especially one that is full of adventure. 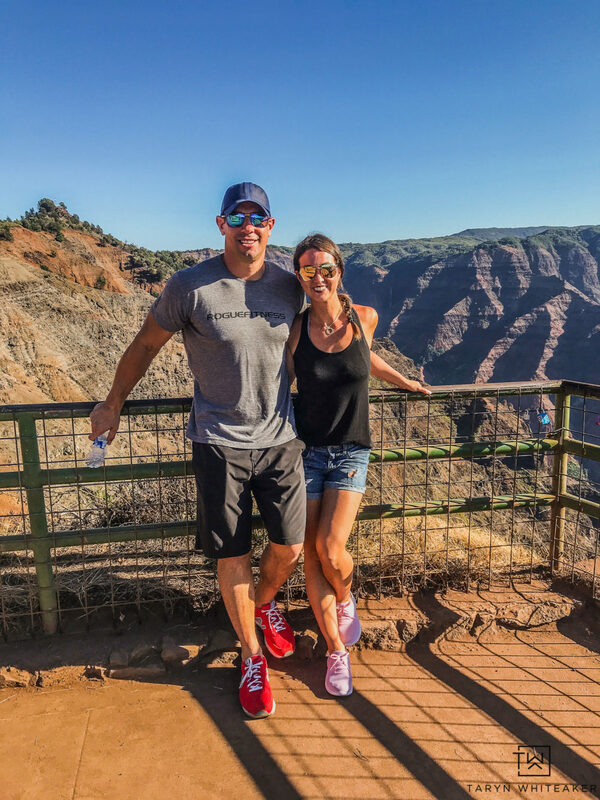 We did SO much on this trip and experienced all that Kauai has to offer. 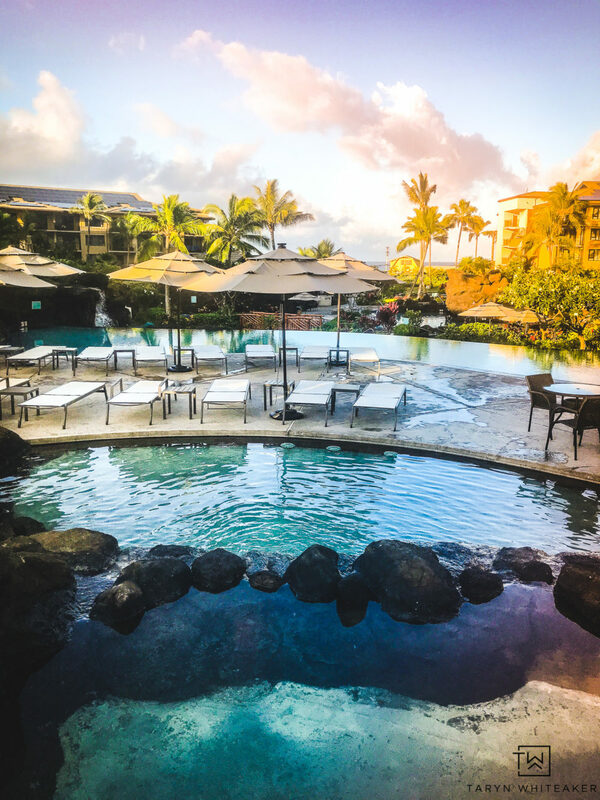 I love reading about other people’s experiences to various destinations, it always inspires me to plan our next trip, so I thought I’d put together a little travel guide on things to do in Kauai. You know, in case any of you are planning a trip soon! This was probably one of the most active we’ve ever been on a vacation in years, and I loved it! The thing that amazed me the most about the island is the diverse terrain. 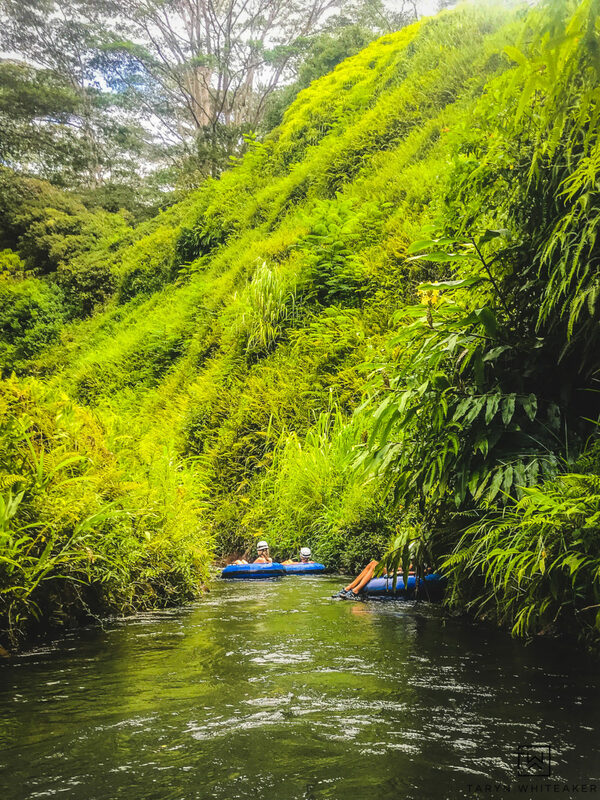 You can be on a beach snorkeling, then hiking through the lush jungle and then kayaking, tubing down the sugar plantations and then hop on a boat to see the Napali coast. We saw SO much of the island, I’m quite positive we touched every area and explored all the different landscape the island has to offer. Here are a few of our favorite activities from the trip. 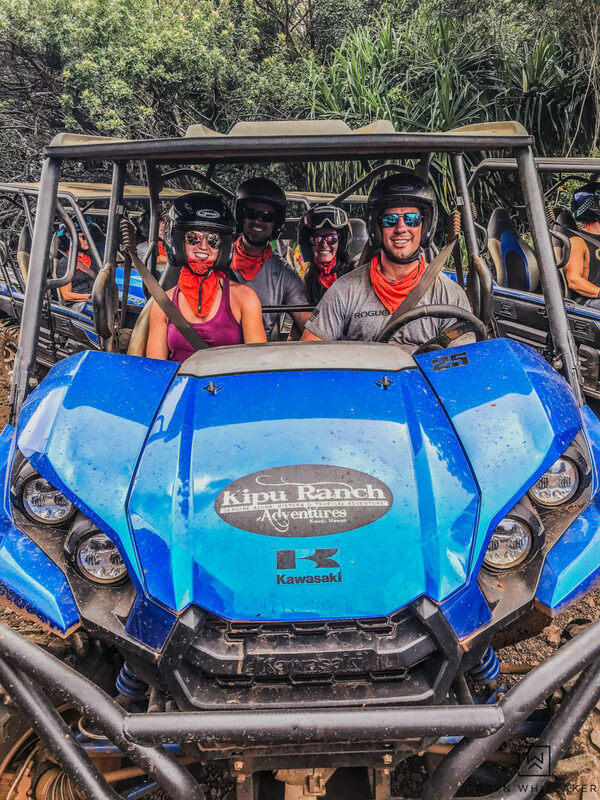 There are several companies who do ATV tours on the island, but I would bet that Kipu Tours is the best! These guys were awesome. 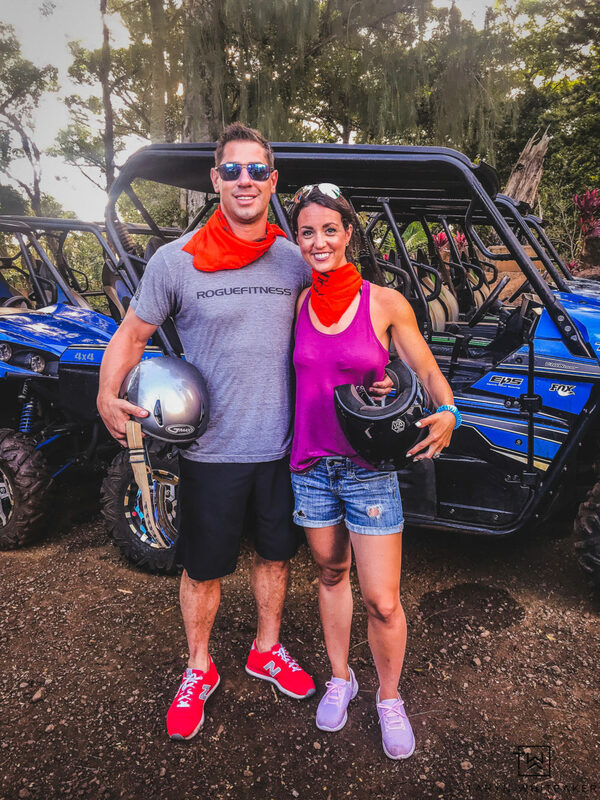 Since we have experience driving ATV type vehicles, we wanted to get on the VIP Advanced Tour which is supposed to have harder courses but it was sold out, so we did the Ultimate Ranch Tour which is a 3 hour ride the includes site seeing, a fun historical tour and rugged terrain. It was a blast. We did the early bird special that leaves at 7am to save a little bit of money and we loved it. Ryan and his brother were our guides and they had us laughing the whole time and were extremely helpful. The only thing I wish we would have done differently on this is that I wish there was more riding and less talking. But I think this was more of a beginner course, they have more advanced ones in some of the other tours. At the end of the tour, we stopped at the river where they filmed Indiana Jones. We had a few extra minutes so they let us dive in! I mean, how cool is it to say that we swam in the same waters as Harrison Ford! They had a big rope swing at the river, so my husband and I and our friends all took a big plunge and got a good cool off. One of the last scenic stops on the trip was to this lookout. It was stunning. That little beach down there is a public beach, but you an only access it by boat since the surrounding areas are all private land. We kept trying to find a way to get there, but no luck! It looks so dreamy. I can’t say I ever expected to float down an old irrigation system in an inner tube. And surprisingly, it was an absolute blast and a once in a lifetime experience. This was such a fun excursion but I will warn you now, book FAR in advanced. I highly recommend booking at least 4 weeks before your trip to make sure you get on a tour. This old sugar plantation irrigation system was built by hand to water the vast sugar cane but was closed for production in 2000. 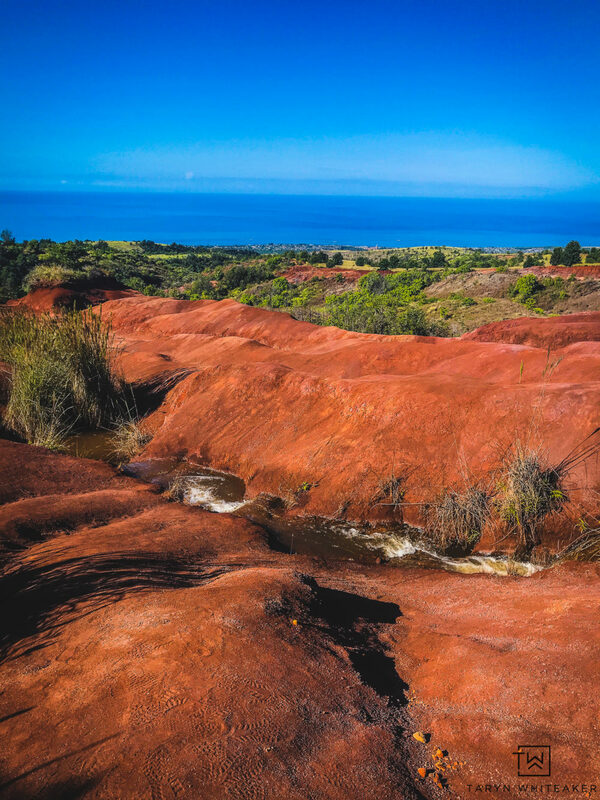 Soon afterKauai Back Country transformed the system into an awesome recreational activity that’s fun for all ages. 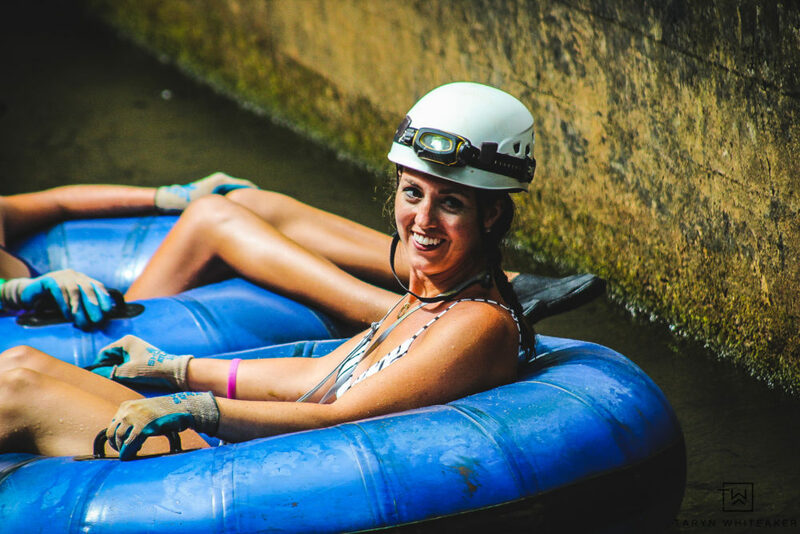 You hop in a tube with a helmet and head light and head down several miles of underground tunnels. Some parts are low key and relaxing while other parts were a little more swift and you definitely had to hang on! The guides help you navigate the tunnels and make sure you always know what to expect. Marcus and and Sierra were such fun guides and made the trip light hearted. 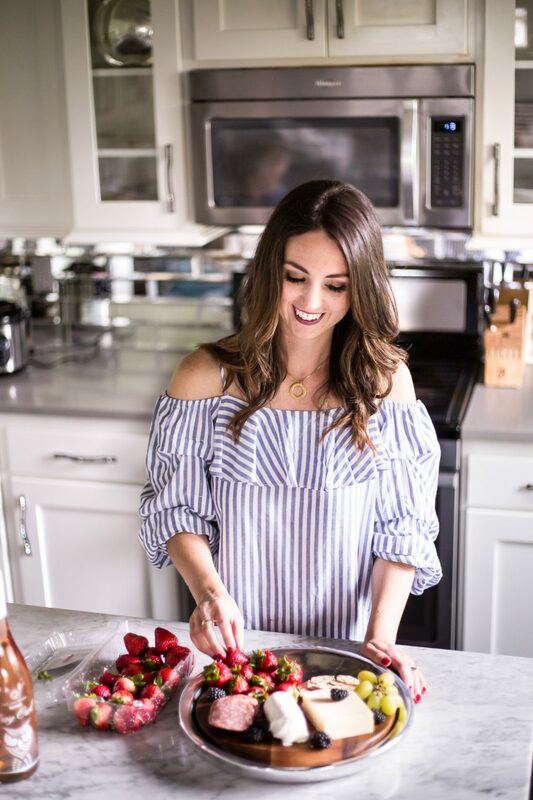 I would definitely put this on your list for adults or the whole family! 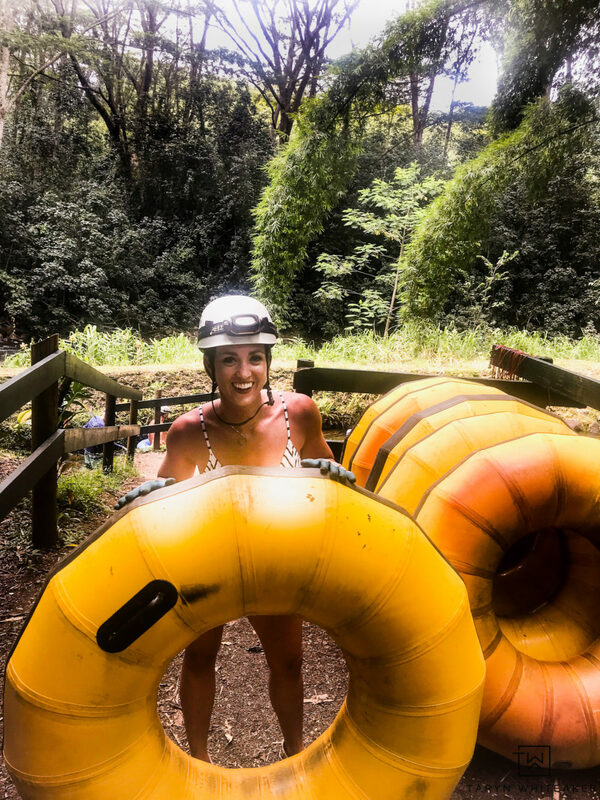 They have small tubes available for kids, but here are a few spots in the journey that do get a tiny bit swift but the guides help out a ton. I’ll warn you, this drive is filled with lots of short turns and could make one super car sick. BUT, it’s totally worth it. 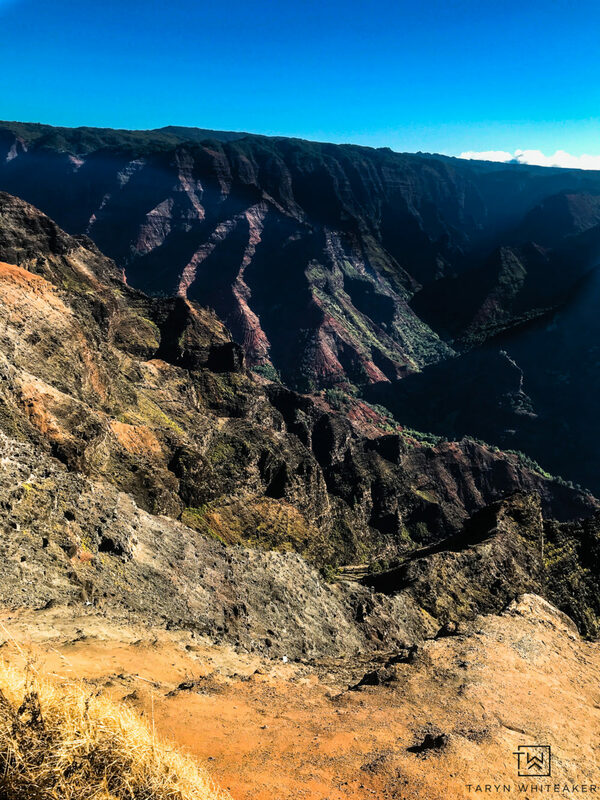 They nickname the Waimea Canyon “The Grand Canyon of Hawaii” and it is just that. 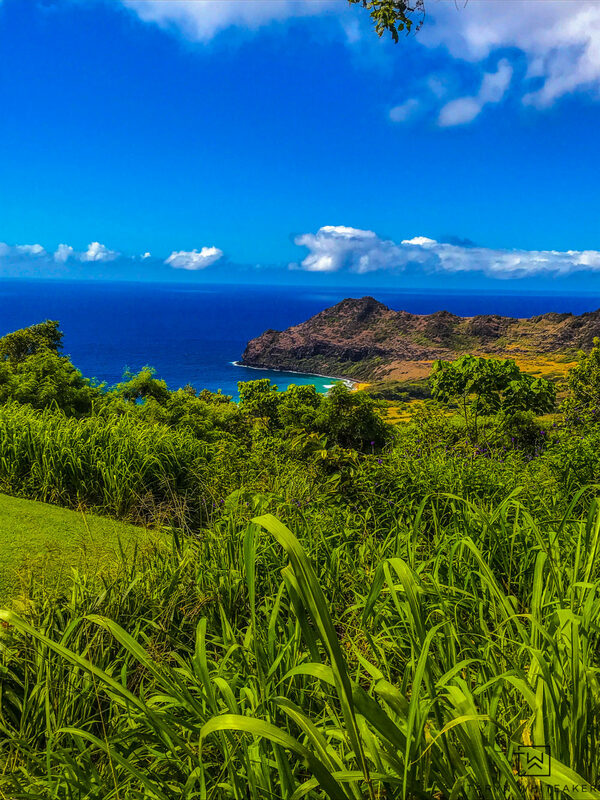 The incredible lush greenery throughout all the mountain peaks, views of several waterfalls and ocean in the distance. Everywhere you look is filled with incredible scenery. If you like to hike, there are a lot of different turn-offs along the drive where you can hike to different view points and beyond. We turned off a few times. I loved seeing this beautiful rust colored rocks and terrain. This was such a gorgeous part of the island. I have said it so many times already, but I am amazed at how diverse this island is. 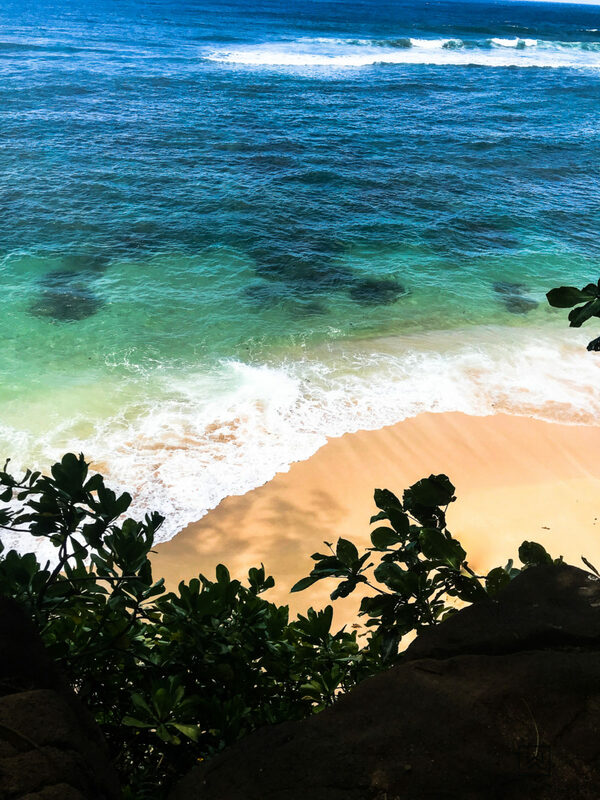 There are SO many beaches to visit and hike into, we barely scratched the surface of them. Here are some of the ones we went to. Hideaway Beach was one of our favorite little discoveries. 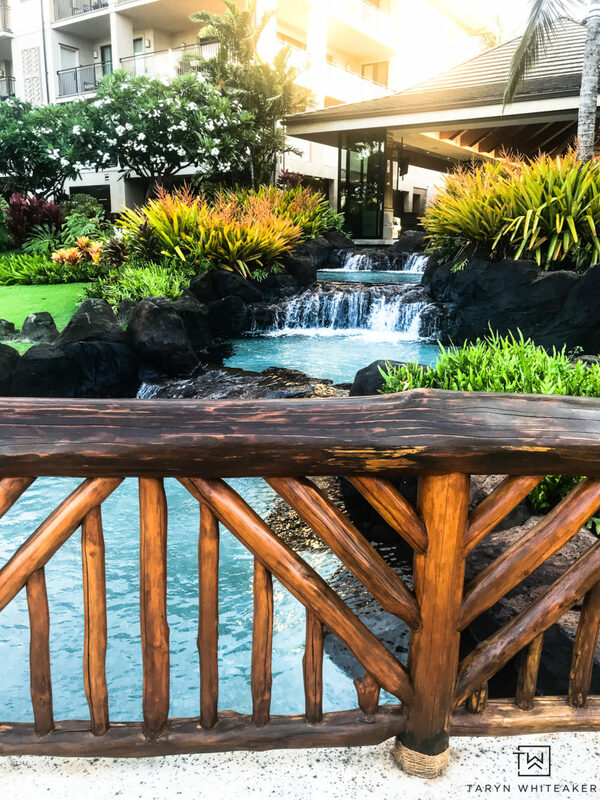 If you head to the north shore, you will want to check out the Westin Princeville and then head down to this little gem for the afternoon. It’s a steep trek down to the beach, so steep that you have to hold onto ropes the way down. The locals say that if it’s been raining it can be pretty slick, but it had been dry so we took the risk and headed down. It’s a short trip and worth it! Poipu Beach is a large public beach right down from many of the resorts. We went on a Saturday and it was absolutely packed with people and families, but this beach definitely had the best snorkeling of anywhere else we visited on the island. Just right off the beach is a huge coral reef where we saw hundred of beautiful tropical fish. You can even swim/walk out to the sand bar and find even more marine life in the tide pools. While were there we even had two seals swim up on the beach and sun bathe for a few hours. It was pretty fun. The beach right in front of the Sheraton in Poipu was also supposed to be a great snorkeling spot. It was a little disappointing in our opinion, not a lot to see and the beach is at a pretty big incline. But a lot less crowded for sure. 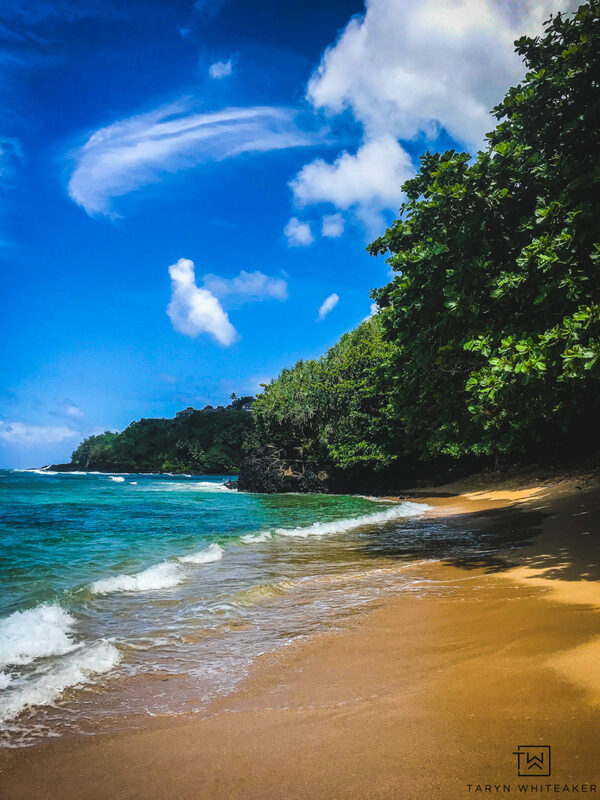 And the last beach is Hanalei Bay! It’s on the north store which is about an hour drive from Poipu. Crazy how long it takes to get around on the island! The bay sits right at the edge of the mountains and has a huge beach front. This is the perfect place to spend a day at the beach, you can take long walks or just lay out and swim. We’ve chatted about what to do, now where to stay! First of all you will want to decide if you want to be on the north side of the island, or the south. 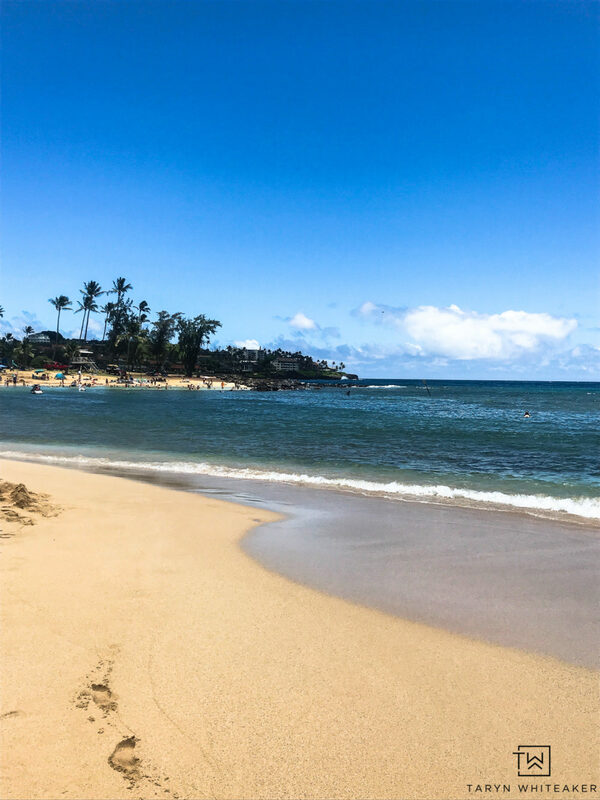 We stayed in Poipu and I highly recommend this side of the island because it’s filled with tons of beaches, amazing restaurants, and the weather is typically better than the north. The ONLY negative thing I will say about their pools is that if they have to shut them down for cleaning for any reason, ie. a kid has an accident or gets sick or someone gets hurt. They have to shut the pool down for a minimum of 6 hours straight for cleaning. This happened TWICE during our stay which was a big bummer. One of my favorite things about going on vacation is waking up early before everyone else and walking around a quiet resort with a cup of coffee and some good company. My husband and I ventured out to the quiet pool area a few times during our stay and I love how calm and beautiful the whole area was. If you don’t hear from me for a few days, it’s because I’ve escaped back to this paradise! The grounds were beautiful maintained, they were absolutely perfect and so serene. That’s another thing that really impressed me with this entire resort was how clean and well kept it was. Everything from the exterior, the landscape and the rooms. Often times you hear a resort has been updated and you walk in to see a poor paint job and bad taste. This place was definitely not like that. It still felt new, our room was beautiful with a full kitchen and living area. 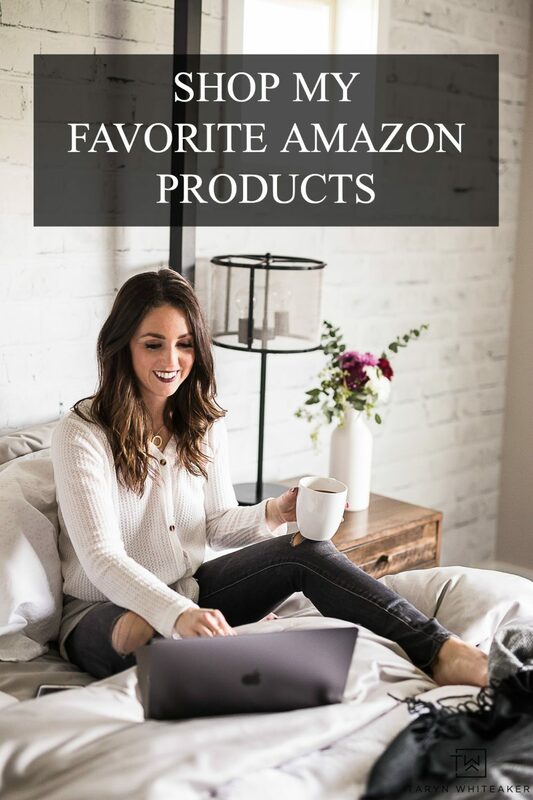 We were incredibly impressed with everything. I can’t complain about the sunsets either. We lucked out with a lot of gorgeous nights! 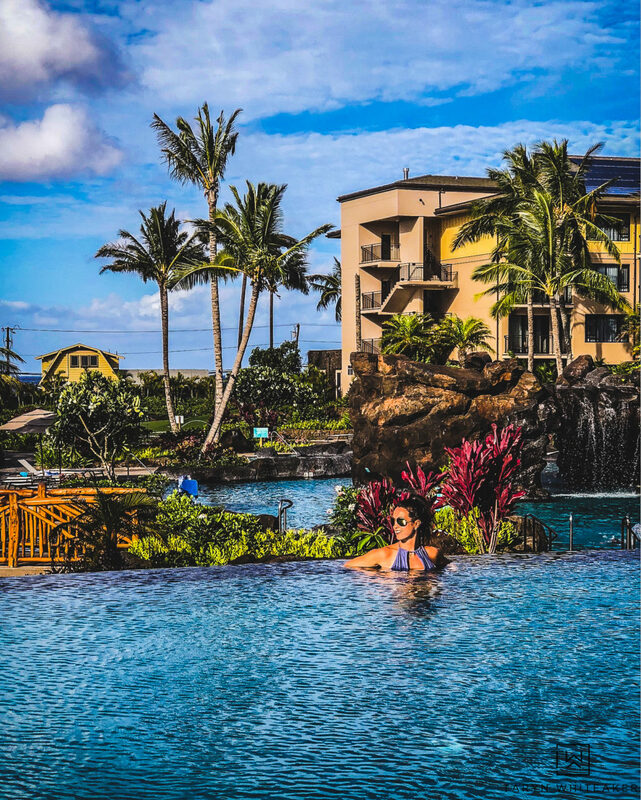 The resort offers a free shuttle service to places around Poipu. So every night we were able to get a quick ride to dinner and they would also pick us up. SO awesome. The staff was incredible. Every single person we interacted with on the resort was incredibly hospitable and so nice. The resort isn’t directly on the beach, but it’s very close. If you walk to the end of the property and cross a small road you will be right on this rocky beach. 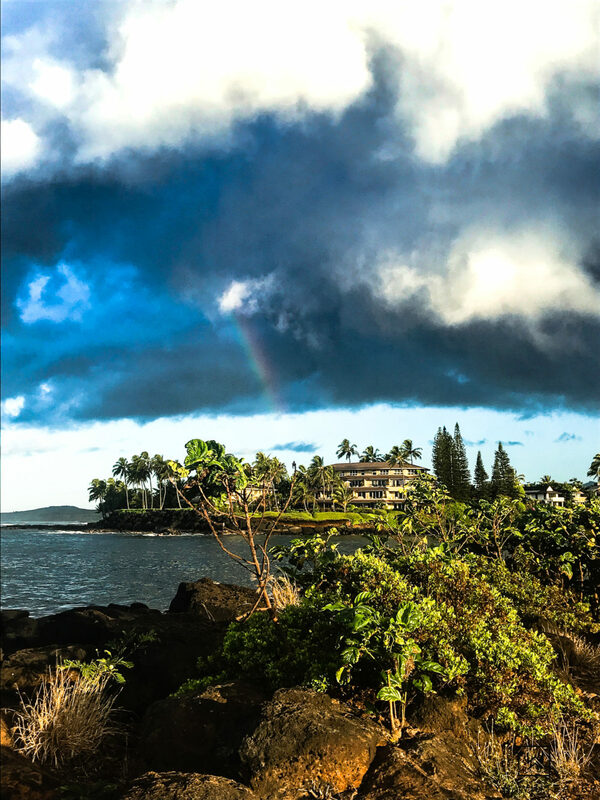 We snuck down right around sunrise and saw the most beautiful rainbow. It was so peaceful to just sit and watch the waves crash onto the rocks. 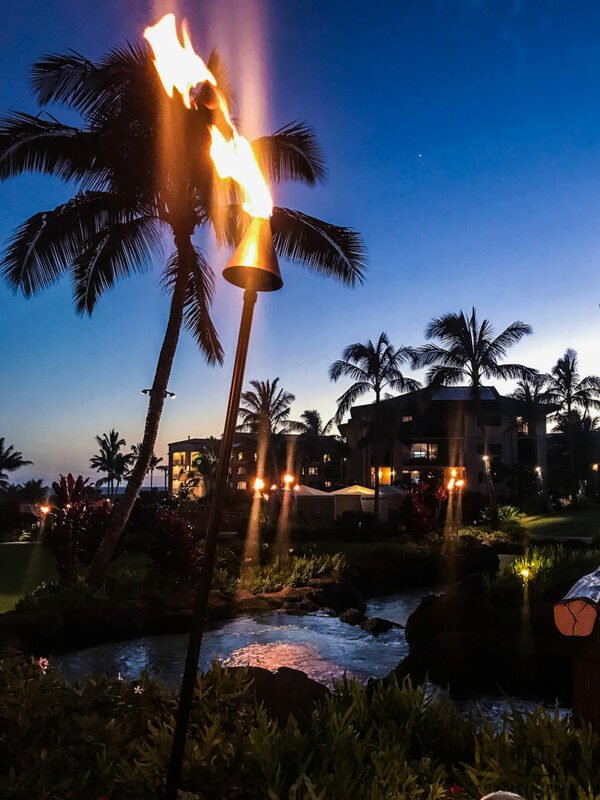 If you visit Hawaii, you MUST have dinner at The Beach House. And not just dinner, but you need to get here right around 6:00 pm, or maybe even a little earlier to grab a table outside and watch the sunset. 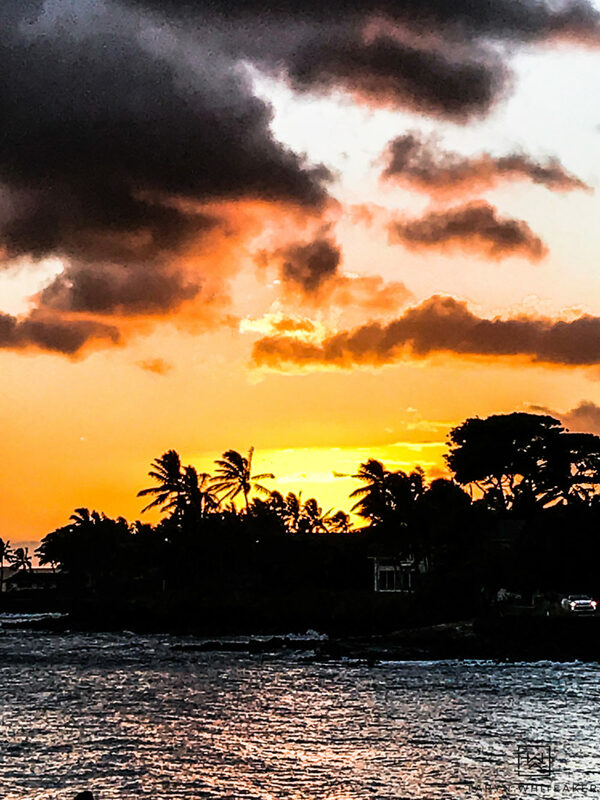 It’s probably once of the best places on the island to watch the sunset, it is absolutely gorgeous and you get to drink and eat delicious appetizers. We loved so much we ate there twice! 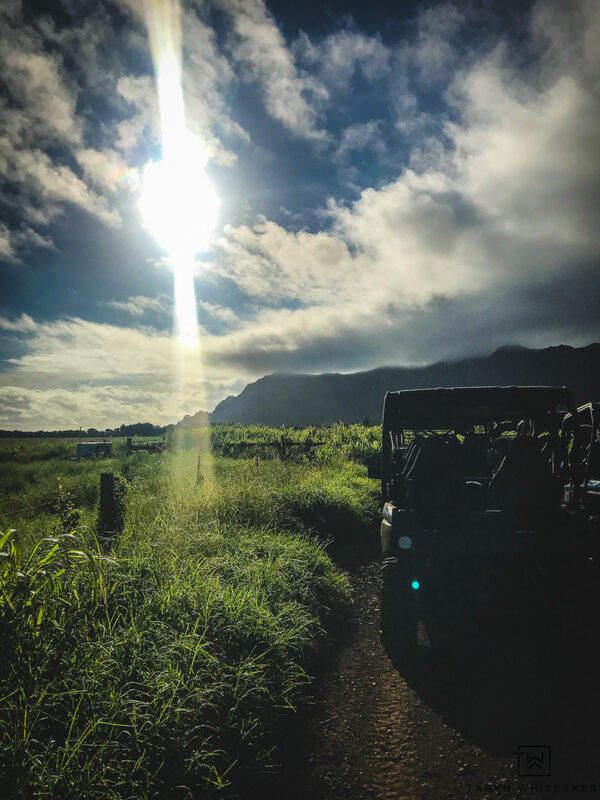 If you are planning a trip to Kauai soon, you will LOVE it! I can’t wait to go back with the kids and see them experience it all. We just need to be brave enough to take them on a 6 hour plane ride!